Being the leading manufacturer, supplier and exporter of Brass Handicrafts we fabricate the quality material. 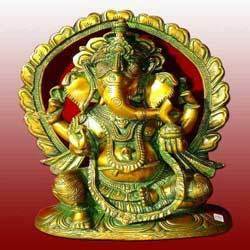 We offer the exceptional range of Brass Ganpati Statues, Sitting Lady Brass Statues, Brass Buddha Head Statues, Sitting Ganesha Brass Statues, Brass Welcome Lady Statues. Our range has designed creatively by our craftsmen, which is acquired from good quality material. We offer a wide range of antique brass handicrafts, brass handicrafts and metal handicrafts, which has a proper finish. Our product range has given a traditional look which is enhancing the beauty of the product. 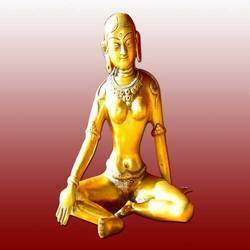 Owing to our expertise in this domain, we are engaged in manufacturing, exporting and supplying an extensive range of Sitting Lady Brass Statues. 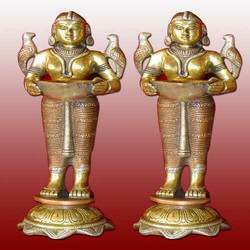 Our offered brass statues are precisely crafted utilizing quality assured raw material and best tools according to the market trends. Elegant finish, excellent design and finely polished by our craftsmen, which is available in different shapes and sizes. Offered brass statues are highly appreciated by the customers for its aesthetic appeal, elegant look and high crack & scratch resistance. 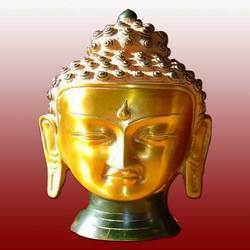 To get the maximum satisfaction of our clients, we are prominently engaged in offering a broad collection of Brass Buddha Head Statues. Offered statues are designed from the premium quality raw material and advance tools keeping in sync with market trends. Our statues are rigorously checked by our skilled craftsman to ensure its premium quality. Moreover, our valuable customers can avail these statues from us at reasonable prices. Our company specializes in manufacturing and supplying an exceptional and desired array of Brass Welcome Lady Statues. Superior quality raw material and colors are used to design and develop our range, which we sourced from the authorized and reliable suppliers of the industry. Clients appreciate us for offering products as per their actual demands; as a result we are getting repeated orders of our products from clients. Our products are available in the market at reasonable prices. We feel immense to introduce ourselves as a leading manufacturer, exporter and supplier of a wide range of Brass Ganpati Statues. Our offered ganpati statues are and carved by our experts using high grade brass metal and are finely engraved with the help of latest carving tools. 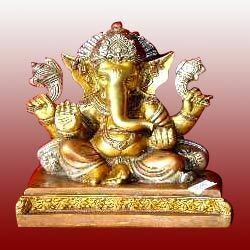 We offer these ganpati statues in diverse colors, sizes and designs as per customer’s requirements. Besides this, our ganpati statues are completely checked from in order to ensure its flawlessness. We feel proud to introduce ourselves as a prominent firm who is dedicatedly involved in presenting Sitting Ganesha Brass Statues. Highly designer and innovative in appeal, these statues themselves speak about the exquisite artistry and the efforts put in by the craftsmen. Also, our provided statue is accessible in different designs & sizes to suit various customers’ requirements. These are tested on various stringent parameters to get full assurance of their accurate designs, fine finish and durable polish.